The backgrounds of the ProSource® franchise owners vary, but they do have a lot in common. Of course, to own a home improvement franchise like ours, there are certain financial requirements — namely, a minimum of $250,000 in liquid capital, and a net worth of at least $1,000,000. Yet the ability to finance your ProSource franchise alone is not enough to qualify you for this opportunity. ProSource franchise owners also have certain character traits that lend themselves to their success. Successful home improvement franchise owners are committed to serving others. Their desire to help trade professionals offer high-quality products to their clients motivates them to stay on top of industry knowledge, build relationships, and be curious about the products they offer. If you are a service-oriented person, a ProSource franchise may be right for you. To own a home improvement franchise like ProSource, you need to be prepared to network. Not only will you benefit from a wealth of knowledge from other franchise owners, you will also want to be able to connect with the local community to build your customer base. A ProSource franchise owner must be outgoing and willing to talk with people in order to be successful. This is a great moment to enter the home improvement industry, as it only continues to grow. However, this also means that there is more competition in this arena than ever before. The right person to own a home improvement franchise finds this informative motivating, rather than intimidating. People who are motivated to continually improve, especially when faced with competition, are in a better place to be successful in this business. To own any kind of business, you should be a leader. When you own a ProSource franchise, you manage a staff, which naturally calls for leadership, but we also pride ourselves in being leaders in our communities. The ideal candidate for a ProSource franchise doesn’t shy away from stepping to the front of the room; in fact, they love the opportunity to help people be the best versions of themselves. We expect our franchise owners to have a solid grasp on technology. This is because the wealth of resources we offer will be available at your fingertips at the click of a button. In order to connect with other franchise owners, get the support you need, market your business, and learn as much information as possible about this market niche, you will need to be technologically fluent. This doesn’t mean that you need to know HTML or how to build computers, but it does mean that you need to feel comfortable with technology and using it to expand your business. When you own a ProSource franchise, you are connected to a network of individuals who can help support you in everything from learning about products, hiring new staff, credit, marketing, or anything in between. We pride ourselves on it. However, there is only so much we can do if you aren’t a self-motivated individual. You need to be able to take the initiative to learn everything you can about the ProSource brand, the local market, and the products you provide. At ProSource, we consider being self-motivated to be one of the most important qualities in our franchise owners. Not everyone is equipped with what it takes to be a successful business owner, even with the franchise model to support them. A ProSource franchise owner who thrives is genuinely interested in business and is always looking for ways to grow theirs. They have business savvy and have a growth mindset. 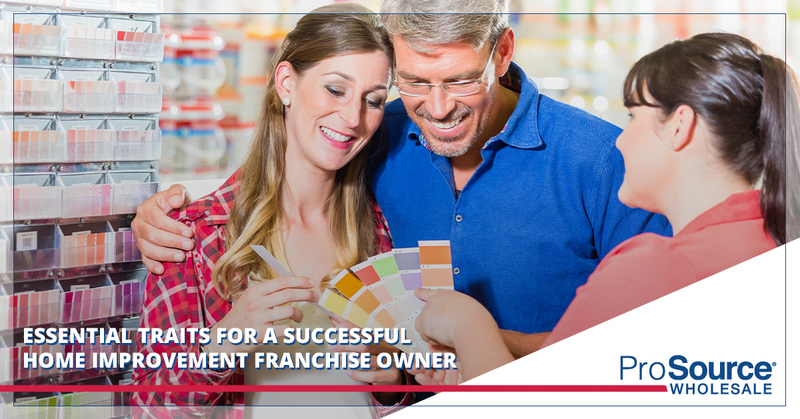 Though it isn’t a prerequisite, many of our franchise owners come from home improvement industry backgrounds. This gives them a leg up because it is essential for a ProSource franchise owner to be knowledgeable about the local market. This is not to dissuade those who have not previously worked at a home improvement business from applying, but to highlight the importance of familiarizing yourself with this market. Those who are most successful know the customer base, what they’re looking for, and what the competition is like before making this investment. If you are an individual who embodies these qualities, we are very interested in speaking with you. Feel free to reach out to learn more about the potential for partnership between you and one of the largest and most successful home improvement franchises in the U.S.